History is made of great characters, conquests and discoveries, exchanges between Civilizations. 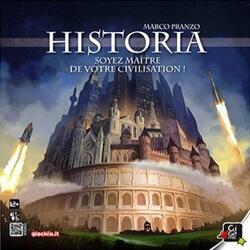 Play Historia and build your Story! In Historia, players guide their civilization through 12,000 years of Humanity history, from the first sparks of fire to the development of high technologies. Multiple actions allow you to evolve your civilization through the Ages. By increasing your level of technology, you will have access to new scientific advances. But do not neglect your military development if you want to emerge victorious from wars and expand your territory. Cleverly manage your Action cards, fulfill the goals of your political leaders and use your state advisers with intelligence to lead your civilization to its peak. The player with the most victory points at the end of the third Era wins the game. A variant to play alone against civilizations managed by the game is included.